The Waginger-Tachinger See, with an area of around nine square kilometres, is surrounded by the farmland of the Rupertiwinkel region. This bow-shaped lake curves through hilly countryside divided up into fields and meadows. A steep, partially wooded bank borders the eastern side of the smaller Tachinger See. It is separated from the Waginger See to the south by only a narrow neck of water with a bridge across it at Tettenhausen. Both lakes are simply referred to as the "Waginger See". The name derives from the present health resort Waging am See, which was first mentioned in a document as long ago as 740. 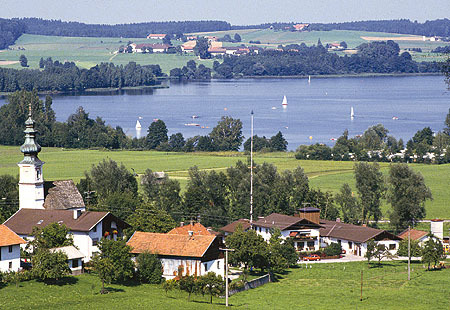 From the pilgrimage church Maria Mühlberg near Waging there is a splendid view of the lake and rolling countryside formed by terminal moraines. Another look-out point is the ruined castle of Tettelham, from which, in good weather, there is a view of the mountains – from the Dachstein to the Kampenwand. The Waginger See is located approximately 120 km from Munich, northeast of the district town of Traunstein. It can be reached on the A8 motorway from Munich to Salzburg (exit Traunstein) or on the B304 via Altenmarkt.